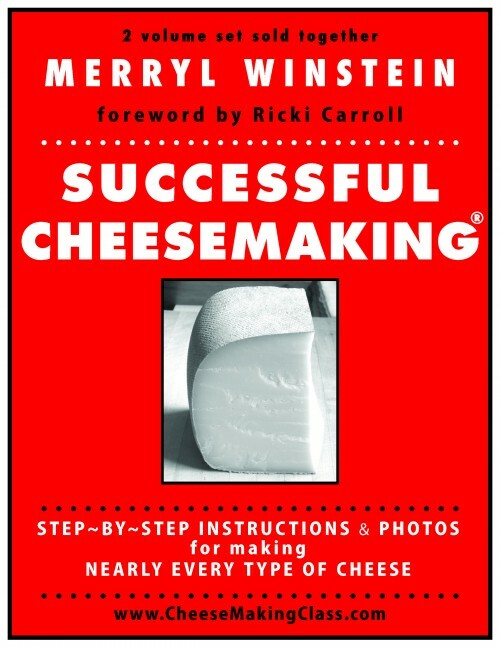 SUCCESSFUL CHEESEMAKING®, Step-by-Step Instructions & Photos for Making Nearly Every Type of cheese. Learn the traditional and professional ways of making the finest artisan cheeses, using simple home equipment. Step-by-step instructions are clear, detailed, easy to follow. With 630 pages and over 800 photos, this book answers all your cheese-making question! Thoroughly researched, comprehensive book progresses from the milk itself, through all kinds of renneted and non-renneted cheeses, grouped by each great cheese family. Explains how varying acidity, salt, moisture, and ripening let you create the delicious cheese styles, flavors, and textures you long for. As a teen, Winstein traveled alone to Denmark to visit her penpal, and discovered the wonders of artisan cheese. Later, she learned to recreate those flavorful European cheeses, while raising dairy goats in her suburban St. Louis, MO backyard for 22 years. And, she attended professional cheesemaking classes in Vermont and in Europe. In the past 15 years, she’s taught about 3000 people the art of artisan cheesemaking in her hands-on, information-packed cheesemaking workshops (www.CheeseMakingClass.com). The culmination of 8 years of writing, research, and travel, the SUCCESSFUL CHEESEMAKING® book finally answers hundreds of questions not covered in other books or media, and preserves the legacy of fine cheesemaking for the cheesemakers of today and tomorrow. Book includes: 630 pages ( divided between 2 volumes).. 800 photos. 30-page index; 20-pages of Frequently Asked Questions; glossary; further reading; list of suppliers; references. BUY direct from publisher & author at www.CheeseMakingClass.com (click here). Or, click link to Amazon.com, choose the $124.99 offer, it's direct from the publisher. Please ask your library and bookstore to order from their usual wholesalers and EARN $10 (learn how/click here). Wholesalers: Baker & Taylor; Brodart; Emery-Pratt; Follett’s; Library Bound in Canada. More info, sample pages, reviews, & complete 6-page table of contents, click here.